Young Pioneer Tours might not have invented the Cutud Lenten Rites festival, but we certainly invented running tours to it! 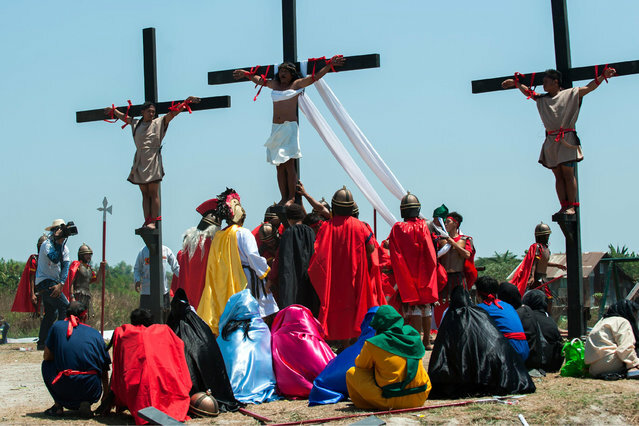 The Cutud Lenten Rites festival is a yearly jamboree where the locals of San Fernando, Pampanga (about 2 hours north of Manila) renact the passion of the Christ. And what does that mean? It means full on nailing themlselves to the cross, all the while through a festival type atmosphere! Not for the fain hearted. The Cutud Len Rities festival takes place in Cutud in the city of San Fernando. San Fernando is about 2 hours north of Manila in the city of Luzon. The nearest major city is the notorious party place that is Angeles. The nearest airport is Clark International Airport in Angeles City. The festival itself takes place like a county fair with stalls, food a play, and then, well, people nailing themselves to the cross for their jollies! Can’t say better than that! Young Pioneer Tours run a day trip, and overnight trip, and a weel long tour that takes us to the Cutud Lenten Rites Festival. For legitimate press, photographers, and indeed even bloggers we can arrange press passes, which is very very different from just turning up for the event. If you’d like to visit the Cutud Lenten Rites Festival then get in touch with Young Pioneer Tours as we are the only company to specialize in taking people to visit this event.